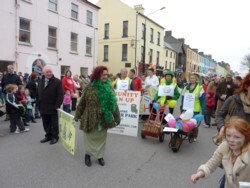 Last month Bandon Tidy Town volunteers took part in the annual St Patricks day parade. Whilst not as sunny as last year, the rain held off and a good time was had by all. We hope to inspire Diarmuid Gavin to design a community garden for the towns people of Bandon. 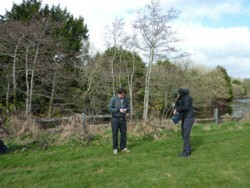 The Glasslinn Circus Field site is somewhat of a challenge. It runs between the river and the main road into the town and right now is just a flat field with a few trees along the perimeter. 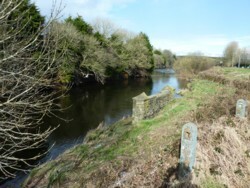 The council have started work on a river walk which runs behind Kellehers and will emerge in the community garden. Our task is to come up with an inspiring brief for Diarmuid. The active retired group will be incorporating fitness equipment in part of the garden and the town councillors will be installing a multi use games area (MUGA) at the far end of the site. Towns people have been coming up with lots of exciting ideas so please keep sending these to us. 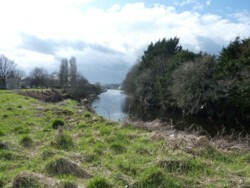 We are a group of about 20 volunteers who meet every Tuesday evening at 7pm at Hartes Car Park in Bandon from March until October. Our aim is to improve the quality of our surroundings which means that we tackle a wide range of projects – painting, litter picking, planting, watering, weeding etc etc. Feel free to join us as we are always looking for volunteers. Just pitch up any Tuesday evening – even if only for one evening in the season.